You'll be £12.00 closer to your next £10.00 credit when you purchase Ship Models from Kits. What's this? Order within the next 8 hours, 2 minutes to get your order processed the next working day! In the past thirty years the world of model kits has undergone a veritable revolution. New techniques in injection moulding have improved the scale accuracy and surface detail of the humble plastic kit, while many specialist companies now produce top-quality resin models, vastly broadening the range of subjects on the market. However, the really radical change has been the advent of photo-etched brass fret, which allows the finest detail to be reproduced to scale. In ship modelling, this has resulted in a new form of the hobby, mid-way between traditional build-from-the-box simplicity and the time-consuming demands of fabricating everything from scratch. These new materials have prompted innovative techniques, which are comprehensively demonstrated in this new manual. Designed for those wishing to achieve the best results from their ship kits in the 1:700 to 1:350 range of scales, it uses step by step photographs to take the reader through the building of two models, one in plastic and one in resin, from basic construction, fittings and detailing, to painting, finishing and display. Written by a highly experienced, award-winning ship modeller, the book is a showcase for the contemporary approach to the hobby. Overall the book is well laid out and the photographs are top notch which will make this book well worth having on the work bench. Strongly Recommended for ship builders. With full colour photographs throughout, this is without doubt, one of the best books on the subject of small scale ship model making I have ever seen, whether you're a novice or an experienced modeller, working with plastic or resin kits, this book is definitely for you. Overall it is a small manual for naval modellers plastic or resin in which the author by construction of two small-scale models, makes us share in his great personal experience emphasizing especially those conflicting and sensitive issues that arise during construction, detailed and superdetailed, helping to save through their practical advice. The book is well structured. David starts giving a number of references to the houses on the market models, comparing the quality of them, speaks of the existing literature in magazines and specialized books with interesting comments on how it is edited and the quality of graphics and photos we will serve as help in building or rebuilding our model, we describe a basic way the type of tools, brushes and paints that we need and gives us a series of small annotations of how to understand the pictures that we will see during our reading. The book is quite interesting for any fan naval model either in plastic or resin and especially very useful and practical for those fans who have an average level of experience or higher. A very useful book for the beginner, but advanced modellers can easily learn something as well. 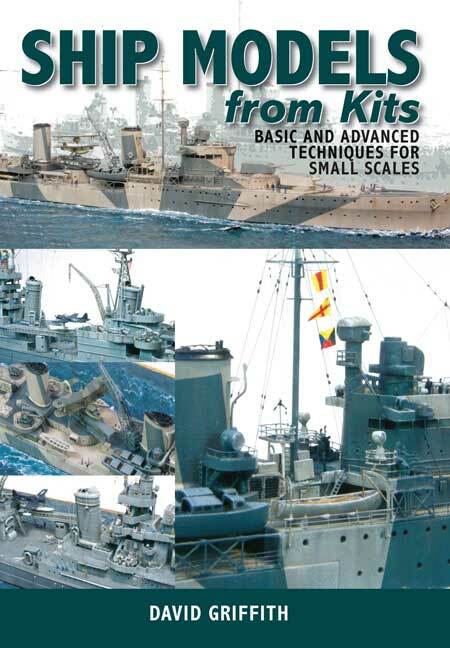 For anyone wanting to try warship modelling, especially in perhaps the most common 1/700th scale, this guide from David Griffith is really quite excellent. An excellent modeller, and regular prizewinner with his ship models at competitions both in the UK and the USA, the author has put down on paper, along with very good supporting photos, advice to help you get to grips with the basic techniques for warship modelling. If you are new to model ships, this will be an excellent option to get you going, and even for more experienced modellers, I think you will find a number of useful hints and tips in here.